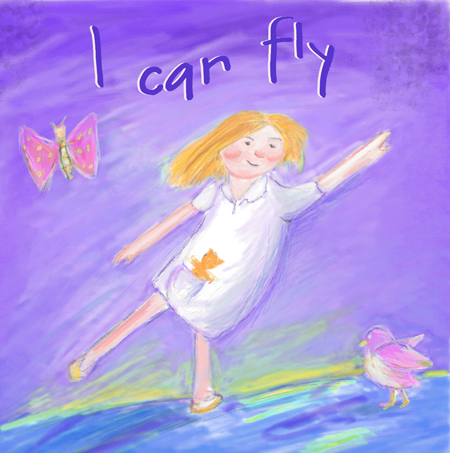 Today I am trying to work on some illustrations for a story I wrote about a girl called Lucy who wants to fly. My normal children illustration style is quite detailed. I have done a couple in my usual style but something tells me it is not right for the story. So, I thought I would try a more childlike style in Painter. Here is one of the illustrations in my usual style. The story is a picture book for 3 - 5 year olds. An age group which is out of my comfort zone! What do you think; the childlike style would be quicker as the story needs 17 – 20 pictures. Lol. Both are amazing but I prefer the childlike style... it's freer, loser more unique and less contrived! !At first I thought it said "car" though. She is adorable and kind of looks a bit like you!! Check out http://picturebookillustration.blogspot.ca/ it has so many children's illustrators and unique styles...so cool...it's on my side bar in my blog list!! Thank you Sherrie, I am going to go with my gut and develop that freer, loose style, I done one in watercolour that I quite like too. I am having my op next week so will have time to brood on it, and I wont be tempted to do the detailed work for quite a while. Thanks for the reference to the picture book illustrators site, some wonderful work there. Maybe the girl looks like me because I wanted to fly when I was a child! I like both, but the childlike style a little more. I'd like to read the story too. Will it be available in Germany as well? 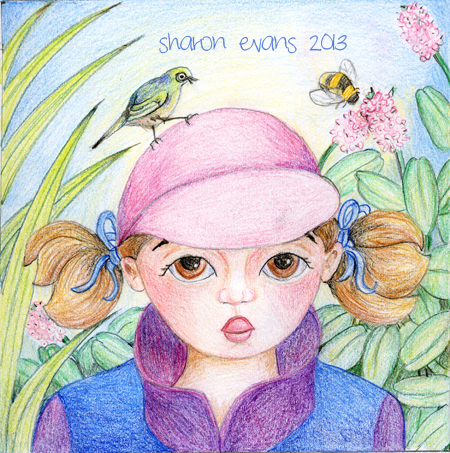 Sharon I love the simpler more child like style of the first illustration, it's great, sounds like a wonderful project you're on!